Following the successful launch of the Georgian Porch and door canopy range, we’ve introduced this latest porch design with classic ironwork supports. This porch is a perfect addition to a classic town or country house façade. A pared down design, this porch is quintessentially English, and has all the familiar Georgian porch design features such as the curved roof ends and sturdy ironwork porch columns. The porch roof is cleverly designed and skilfully crafted from steel, which is then hot dip zinc galvanized for a long lasting finish. The wrought ironwork framework is fully welded and finished in the same manner. Installation is very straightforward, as the roof and sides are made in three pieces for re-assembly on site. 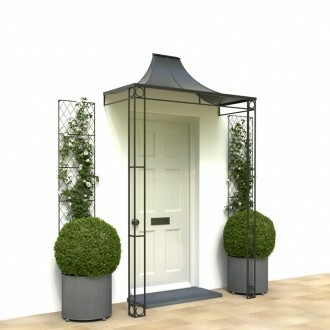 The porch is available in the weathered aged zinc finish or painted black or lead grey. Standard sizes of 5′ and 6′ wide porches available, as well as a made to measure service, just get in touch.